Whilst it may be tempting to place a badge of Attention Deficit Hyperactivity Disorder on a child to explain both bad behaviour and a lack of educational progress at school, dyslexia is one of the first conditions that should be considered and ruled out before seeking tests to see if ADHD is the cause of behavioural and learning problems. Both conditions will require a specialist teaching approach, but in many cases ADHD can be rectified by taking a daily medication. For real sufferer's of ADHD, taking a daily medication such as Ritalin can seem like a 'magic fix' to parents and teachers alike. On the other hand, dyslexic children will always require a specialist teaching approach to help them, and ADHD medication will have little in the way of a positive effect. A dyslexic child misdiagnosed as an ADHD sufferer will still struggle at school and the effects of Ritalin could have precisely the opposite effect to that intended: Ritalin is designed to stimulate an under active part of the brain in an ADHD sufferer; in a 'normal' child it can have the effect of making the child appear more fearful and cautious than they should be as the prefrontal cortex area of the brain becomes over stimulated. Getting the right diagnosis for your child is the most important way to help them, so how are Dyslexia and ADHD similar and how do these conditions differ? As many as one in 10 people have dyslexia, and it is one of the most frequently misdiagnosed learning difficulties in school-age children. Before any serious consideration of ADHD is considered, tests should be made to exclude learning difficulties such as dyslexia. When this condition is unrecognised, children are often seen as inattentive, careless with their schoolwork or academically slow; however it should be noted that dyslexic children are often highly intelligent, creative and inventive. Like ADHD, dyslexia can cause a wide range of learning difficulties at school; this condition does not reflect the intelligence of a sufferer, as it can affect anyone of high or low intelligence. Because difficulties with reading can make a child feel as if they are 'stupid', suffers can have a low self esteem and will frequently resort to disruptive behaviour to avoid having to do scheduled schoolwork. Reading books will be 'lost' or forgotten in a bid to avoid having to read aloud. Any of these symptoms can easily be confused with the spectrum of learning difficulties and behaviours shown in ADHD. 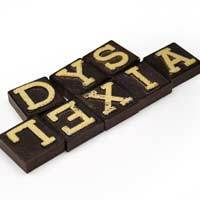 A dyslexic is unlikely to show the symptoms of hyperactivity and impulsiveness that are common is some forms of ADHD. Dyslexic children will still have a healthy fear of danger and an awareness of the consequences of their actions; additionally, they will be less likely to blurt things out and will have no obvious problems waiting their turn, sitting still or paying attention, especially where activities do not involve a requirement to read any texts. Whilst some problems with socialisation may occur if a dyslexic's feelings of self worth are very low, a dyslexic will still find it possible to form and maintain friendships. Additionally, true symptoms of hyperactivity are unlikely, and will certainly not be maintained across a home and a school environment. Differentiating between predominantly inattentive ADHD and dyslexia can be more difficult, as hyperactive and impulsive behaviours may be absent. Comparing behaviours in different environments such as home, school, and the playground will be revealing, and a behaviour diary kept at home and school can be very useful to help teachers and parents uncover when and where bad behaviours are shown. If the problems are not shown equally across all settings it will not be ADHD, and parents and teachers alike will need to look for other more traditional causes for the problems. My son has is 8 years old now and can hardly read. He does not read. It seems as if he is struggling to get the alphabet in "his head". His writing will differ from large to small. In maths he is also struggling. The only way he remembers what a number is is by counting on his fingers. His teacher said that he is having trouble concentrating. I have also noticed above.About two years ago my son had tick fever which resulted in a seizure. We had rushed him to the doctor. The doctor injected him and everything (eyes) were pulling to his left side. This lasted for approximately two hours. Where you could see he is not with us.I dont know whether above caused brain damage. Ask your GP about this. If your child is falling behind significantly at school, the school staff should be able to help point you in the direction of an assessment.